Education is regarded as a fundamental human right and a key driver of sustainable economic development (UNESCO 2004). Accordingly, the importance of education systems in developing countries has been emphasized (Wagner 2010). As a developing country, Cambodia has one of the youngest populations in the world (UNESCO 2010). Historically, Cambodia experienced a destructive civil war in the 1970s. About two decades later the country began to rebuild its education system through teacher training, curriculum revision, and massive distribution of textbooks.The Ministry of Education, Youth and Sport (MoEYS) has been at the center of such systematic reform of the Cambodian education system. According to Education Strategic Plan (ESP) 2006-2010, a report by MoEYS (2006), the Cambodian government has set priorities such as ensuring equitable access to education and increasing the quality of education services. Even though the goal of equitable access to education has been achieved, at least in urban areas, improvement in overall educational quality has been slow, particularly at the secondary school level (Engels 2010; Symaco and Brock 2013). 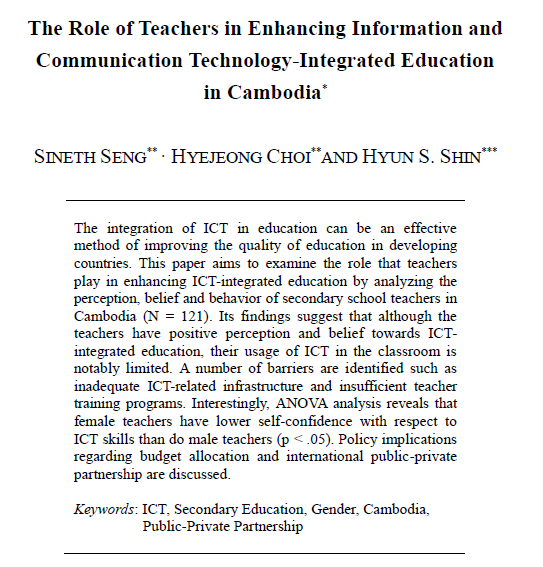 For achieving sustainable development of Cambodia, however, improving the quality of secondary education is indispensable as the dropout rate remains high and the students’ competency is still limited (VSO 2010).